A kidney bean allergy is rare, but you may be at greater risk if you’re allergic to other foods in the legume family. Peanuts and soy beans are two of the most common legumes that cause an allergic reaction. If you’re allergic to either of these foods, you are at greater risk of having an allergic reaction to kidney beans. If you develop adverse reactions after eating kidney beans, call your doctor immediately to discuss the severity of the symptoms. A kidney bean allergy is the result of an overactive immune reaction to the proteins found in the bean. Shortly after eating the kidney bean, your body doesn’t recognize the proteins in the food and begins to defend itself with antibodies and histamine. Antibodies are released to fight off the kidney bean proteins, and histamine attempts to protect the body from infection. Too much histamine causes inflammation in soft tissue in various places in the body. This is the main cause of most kidney bean allergy symptoms. Symptoms from a kidney bean allergy can vary from mild to moderate. In rare cases, you may develop a severe allergic reaction that can cause anaphylactic shock. Common symptoms include nausea, vomiting, severe diarrhea and abdominal pain, reports Foodreference.com. As with any food allergy, you may become short of breath, have difficulty breathing, begin wheezing, coughing and sneezing. Digestive symptoms include diarrhea, vomiting, nausea and stomach pain. Your skin may react by forming hives or eczema anywhere on the body. Kidney beans are related to soy beans and may cause an allergic reaction whenever you eat either bean. Kidney beans, string beans, black beans, pinto beans and chickpeas are all closely related to the soy bean. Being allergic to one bean, however, does not necessarily mean you will be allergic to the other, according to Food Allergy Research and Education. Many people think that peanuts are tree nuts, but they are actually legumes. Peanuts contain similar proteins as many tree nuts and other legumes. If you are allergic to peanuts or kidney beans, you need to use caution with other beans. Your doctor or allergist will inform you of what you can and cannot eat. Food Allergy Research and Education states that the most effective treatment for any food allergy is to avoid consuming the food. 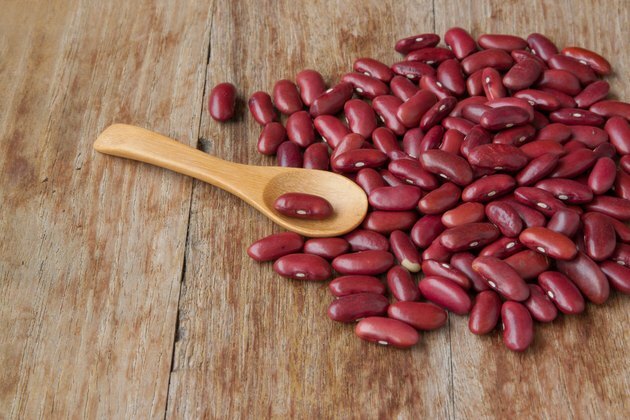 If you develop allergy symptoms from other legumes related to kidney beans, you can treat mild symptoms with an antihistamine to reduce the amount of histamine in the body. If you desire a plant-based protein for chili or soup, you can use quinoa to get similar nutrients without the risk of an allergic reaction.